Yesterday I went to see my 19-year-old daughter Hadas perform in a play about the story of Purim. She and the 4 other national service girls (who are spending the year teaching Jewish values at secular schools in Ramat Gan) did such an excellent job. Their presentation enabled me to see Purim story more clearly than I ever have before. For the first time, I fully grasped Esther’s suffering, forced into a loveless marriage with Achashverosh, separated for her entire life from the Jewish community, condemned to a life of miserable isolation. And how incredible, that this lone woman’s self-sacrifice enabled her to single-handedly save the Jewish people from inevitable genocide. And I was reminded of this past Saturday, spent with several personal heroines of mine. Each one of them pushing far past her comfort zone to realize a personal dream and vision for the Jewish people. We spent Shabbat at Nishmat, the women’s yeshiva where Josh has been teaching and running programs for the last 18 years. I am a huge fan of Nishmat which was founded 27 years ago by Rabbanit Chana Henkin, a visionary who dreamed of creating a space for intensive Torah learning for women. And today there are thousands of women and Jewish mothers around the world who feel a deeper connection with and commitment to Torah and Judaism because of the time they spent there. Running an institution of this size and calibre is a huge challenge which requires nearly superhuman levels of determination. Rabbanit Henkin has also faced new personal challenges since the brutal murder of her son, Rav Eitam and his daughter-in-law Naama HY”D, last year. But it has been awe-inspiring to see Rabbanit Henkin, despite the tragedy, continue guiding Nishmat and its hundreds of students towards the future. At 3rd Meal I had a chance to speak with Racheli Fraenkel, who also teaches at Nishmat. I love Racheli, she’s one of the most down to earth people I’ve ever met. And it’s been remarkable to see how the inhuman murder of her son, Naftali, has transformed her from a teacher and mother into a public figure, a source of inspiration for thousands of people around the world. After Shabbat, I attended a Melaveh Malka with Lori Palatnik of the Jewish Women’s Renaissance Project. I was invited since we are a Shabbat of a Lifetime host family for the JWRP women, which has enabled me to see first-hand what a powerful emotional and spiritual impact JWRP has on its participants, providing in almost all cases their first meaningful exposure to Judaism and Israel. It was such an inspiration to hear from Lori how JWRP has grown over the last decade from a dream into a thriving program, with a 10 million dollar annual budget and over 10,000 graduates. All of these women–Rabbanit Henkin, Racheli, and Lori– in my eyes, are modern-day Esthers. Doing what needs to be done to help the Jewish people. Person by person, day by day. may all these wonderful women, teachers, anyone that reaches out to others with love, patience, and understanding, should have continued strenghth to bring all jews closer. This is so inspiring. The truth is that every jewish woman is also a Esther for her friend, neighbor, pupils, coworkers….because often We dont know if a Word, or and act Will save their life. 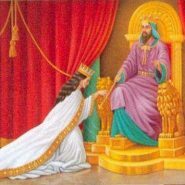 May We all have the strenght and patiente as Queen Esther.